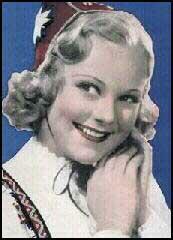 Sonja Henie was born in Oslo, Norway, on 8th April, 1912. Henie began ice-skating at the age of six and four years later was the Norwegian national figure-skating champion. In 1927 she won the world amateur championship for women, holding the title for ten consecutive years. Henie was European Womans Ice Skating Champion (1931-1936) and won the Olympic gold medal for figure skating in 1928 (Germany), 1932 (United States) and 1936 (Switzerland). Henie turned professional in 1936 and starred in touring ice-shows before going to Hollywood where she made several films including Thin Ice (1937), Happy Landing (1938), My Lucky Star (1938), Everything Happens at Night (1939), Iceland (1942) and The Countess of Monte Cristo (1948). Henie and her third husband, the Norwegian shipowner Niels Onstad, the Henie Onstad Art Center, near Oslo. Sonja Henie died of leukemia on 12th October, 1969.